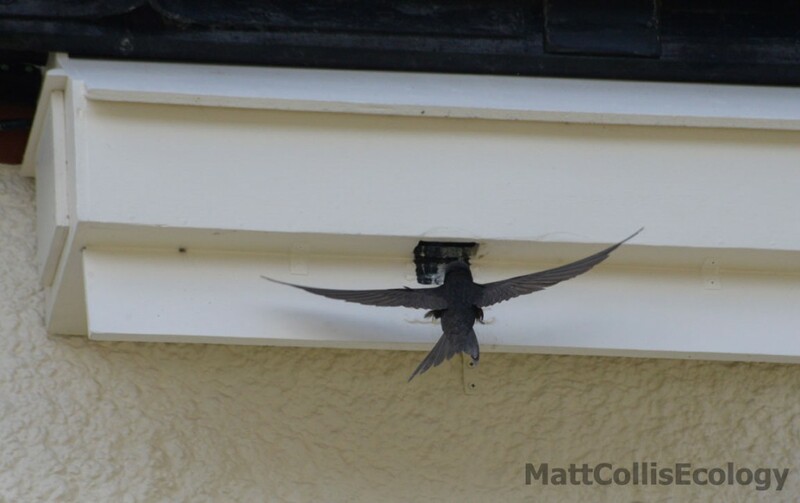 Below is a selection of swift photographs and videos we have taken both from inside the nest boxes and around our house, highlighting the unique behaviour of this fascinating bird. 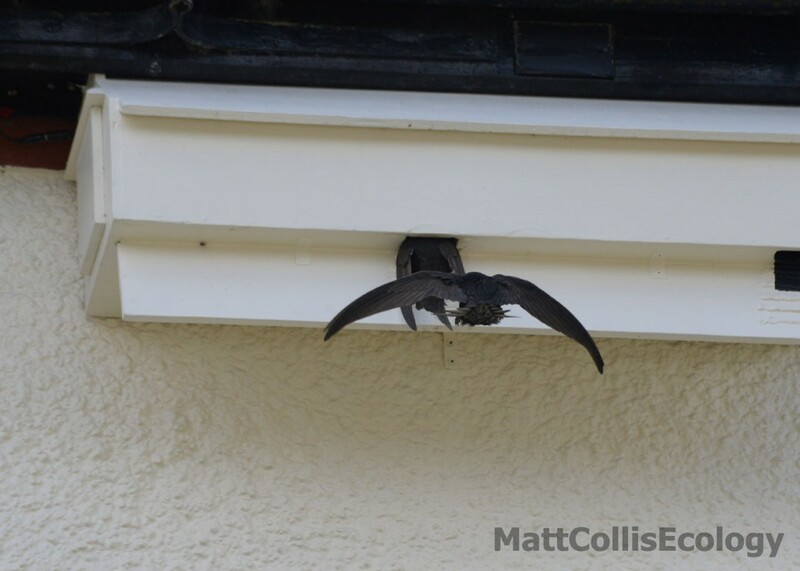 These photographs show prospecting swifts exploring potential nest sites. They often have trouble landing for the first time. One of the main reasons is that they have very short legs, which they haven’t used since they fledged 3-4 years ago. To help build up their confidence I have found that by darkening the entrance hole and roughening the landing strip below has helped them overcome this difficulty. This video shows non breeders looking for prospective nest sites for the following year. Take a look at the box nearest the drainpipe on the left as the resident swift enters (27 seconds into video) and is immediately followed by a non-breeder who perches on the landing strip. The resident bird can be heard screaming at the non-breeder that this box is occupied. It takes the hint and flies away! 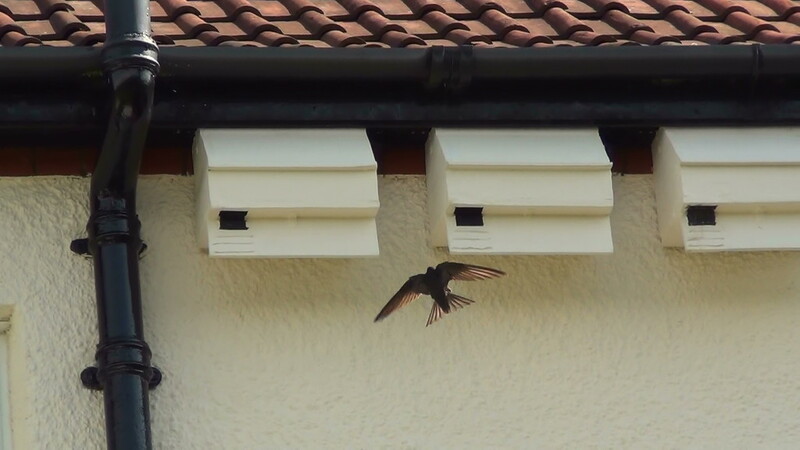 Swifts flying low level in a screaming party close to our swift nest boxes. 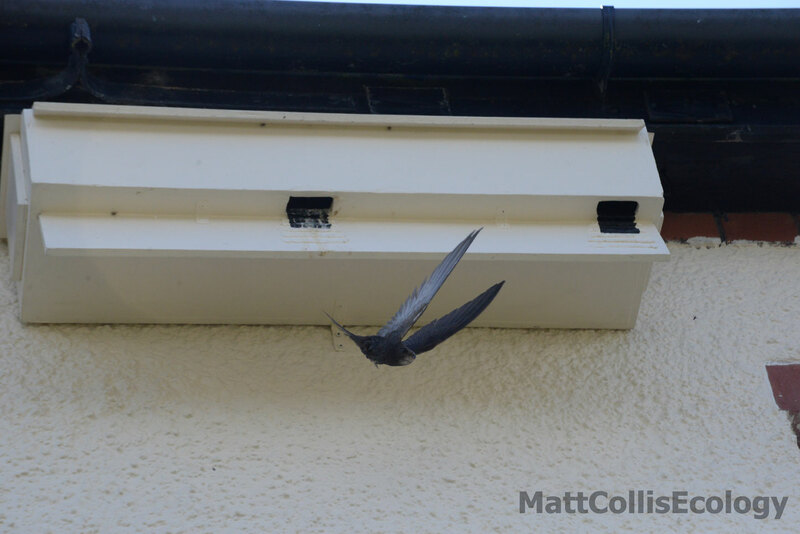 They tend to only scream when they are within 50 metres of an existing swift colony. 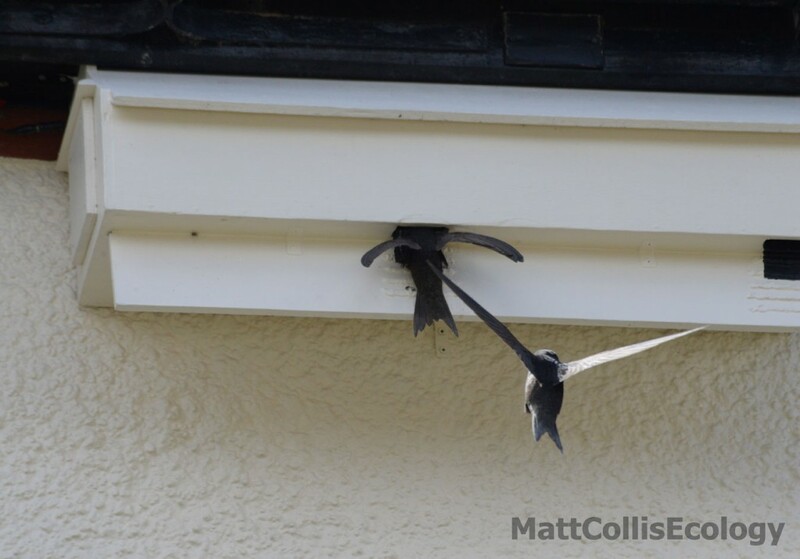 Juvenile swifts prospecting for suitable nest sites and attempting to enter a nest box. They are cautious about entering because they are trying to see if the box is already occupied and avoid a fight with the resident bird. Parent swift feeding chicks. Larger chick is 3 days old and the smaller chick 2 days old. Also in the nest box was an infertile egg that was thrown out of the box a few weeks later. Swifts usually lay 2-3 eggs in late May/early June and only have one brood per season. Two swifts chicks (20 and 21 days old) preening in nest box. Juvenile swifts have white edges to their feathers and much whiter faces than the adults. Young swift (42 days old) with its characteristic white face looking out of nest box, just about to fledge.It fledged the following day migrating non stop to Africa. It will not land again until it is ready to breed in 3-4 years time, when it returns to the local area to find a suitable nest site. 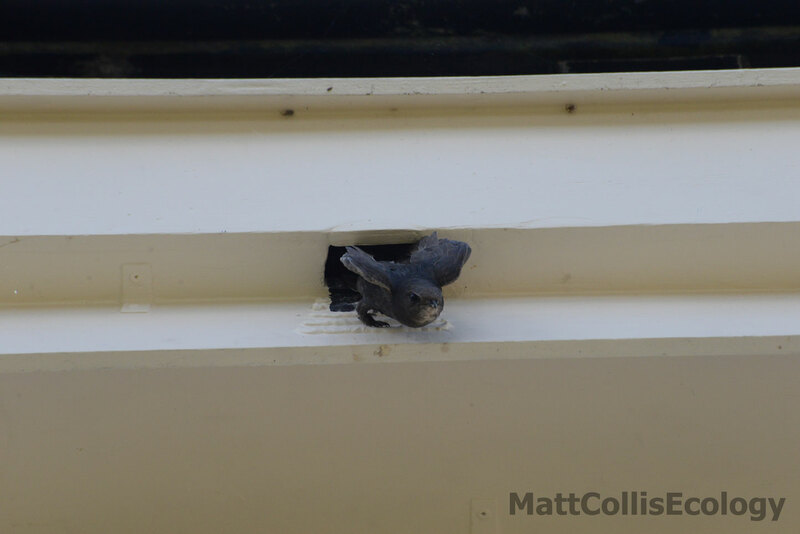 Young swift doing press ups in the nest just before it fledged. It does this to strengthen its wing muscles in preparation for fledging. 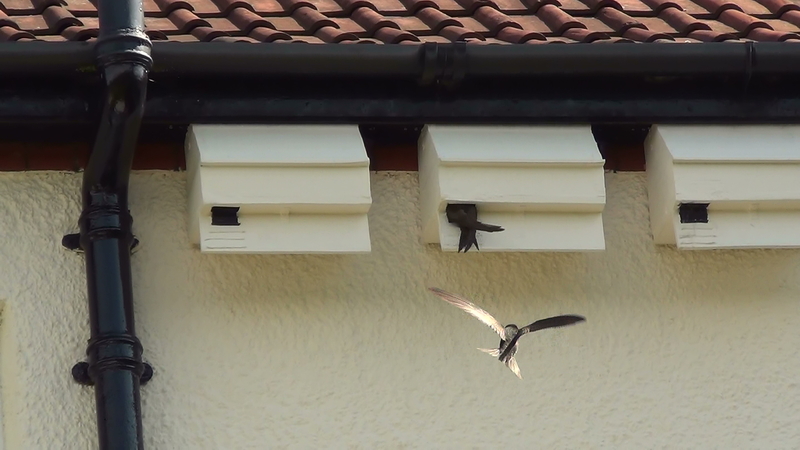 Adult swifts trying to entice the young swifts out for their maiden flight. Young swift finally fledging to join the adults flying around the house. 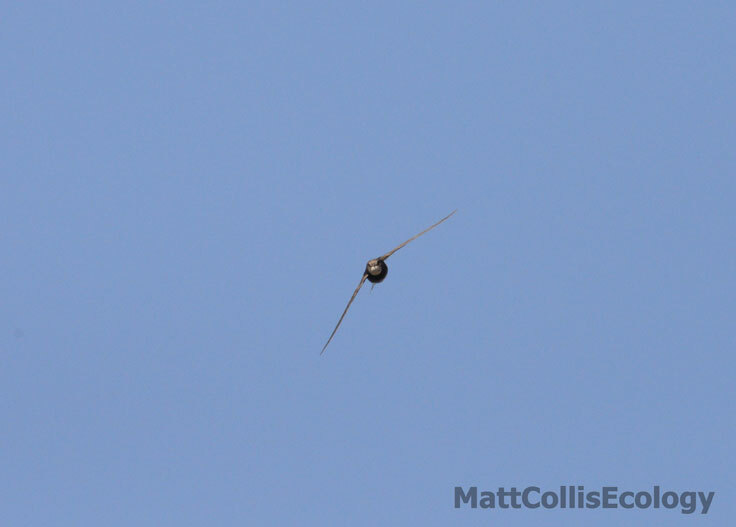 Adult swift swallowing bolus after discovering its chick had fledged moments before it arrived to feed it. The bolus contains 300-500 insects bound together with saliva, which the parent regurgitates. It had difficulty swallowing it before leaving the nest. Our friend Matt Collis, a local ecologist who is keen on swifts spent time taking photos of our swifts as they entered and left our swift boxes on a warm July morning in 2015. Below are just a few of his wonderful photos showing the beauty and elegance of this fascinating bird.